After changing the differential Oils a few weeks ago, it was time to also do the Transfer Box as well. The transfer box takes the same spec of oil as the front and rear axles but just has a slightly larger capacity. It again is a drain and fill to overflow to ensure the level is correct. 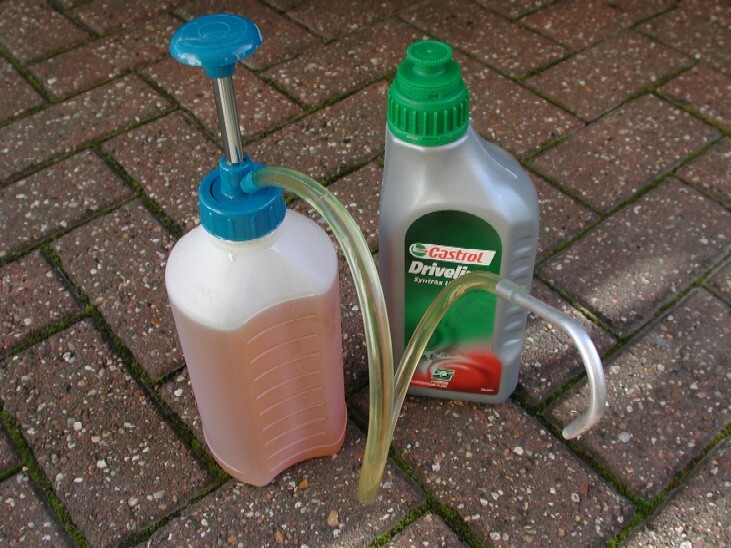 My Local Land Rover Dealer no longer supplies the differential / transfer box oils in 1 litre bottles as they use it from a large barrel in their workshop. So with this in mind I looked else where to see what was around. 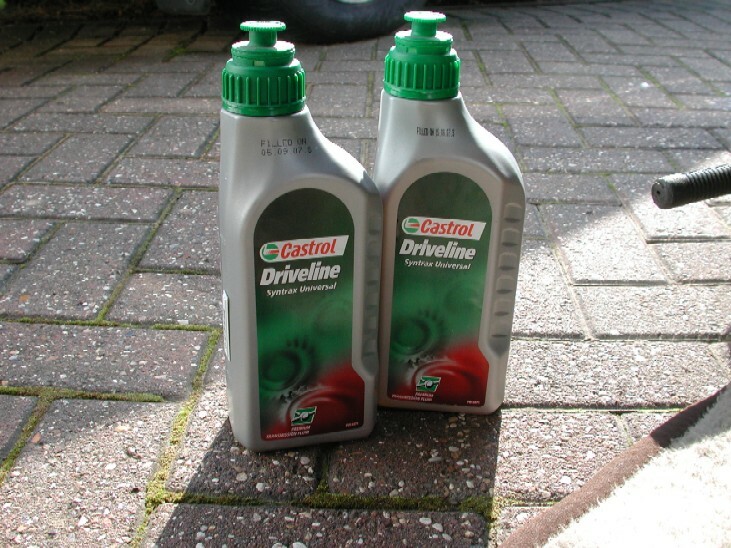 As long as you choose a high quality oil that meets the specifications above, then all will be ok.
Again for the transfer box I chose to use Castrol Syntrax which is a semi-synthetic and it is readily available at my local Halfords store. To make sure you have enough you will have to buy 3 litres, it retails at around £12 a litre. 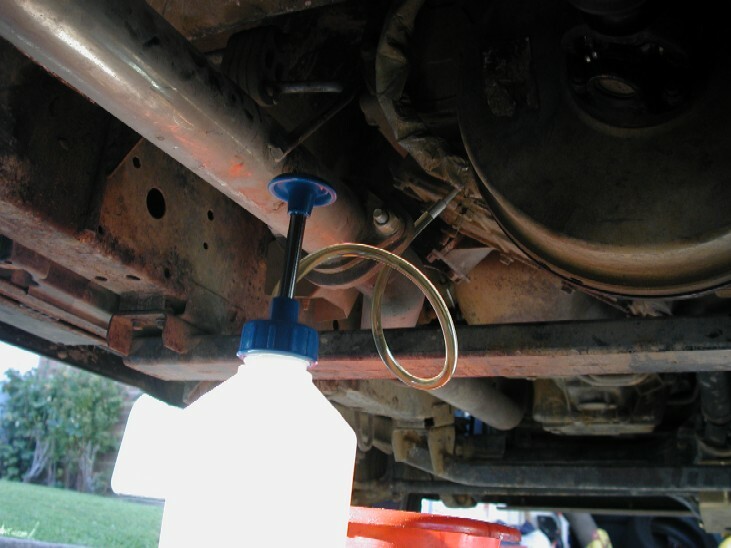 How ever, you "should" have some left from the Differential oils "if you have done them first" as they only require about 3.5 litres, this means you will have enough for the transfer box and you only need to buy 2 litres. So first of, you need to get you truck parked on flat level ground to make sure you can fill the transfer box to the correct level as it fills to overflow. My driveway is slightly down hill in both directions, so I parked the Disco on blocks of wood to even it up. If you get the roofline horizontal front to back and side to side, then that is pretty good to go. Fortunately, unlike the differentials the transfer box has metal plugs for both the drain and refill. They also just have a 1/2" square drive in them to be able to undo them. 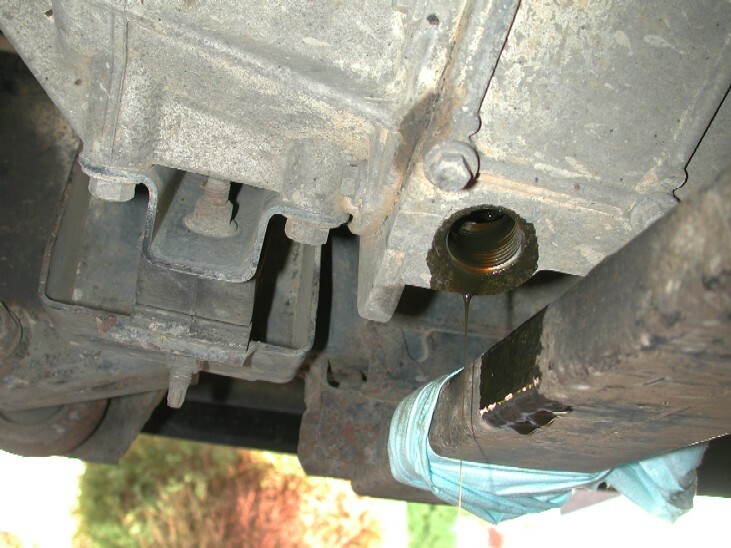 The drain plug is located right on the bottom corner, and the fill plug is located on the back face just by where the handbrake cable goes. Its a good Idea to make sure you can undo / remove the fill plug BEFORE you drain the box of oil. Now because of where the fill plug is, you cannot get "straight" onto it with a half inch extension / ratchet, I used a small 1/2 " drive "wobble" extension, this allows you to get on the plug at an angle to undo it. 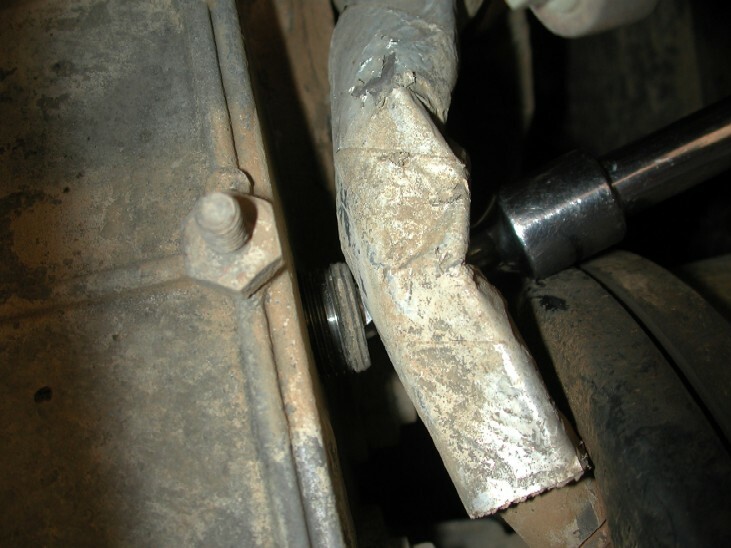 Once that's loose / undone, you can now go and drain the oil. The fill plug is right on the bottom corner and is very easy to get on with a ratchet or breaker bar to undo it. 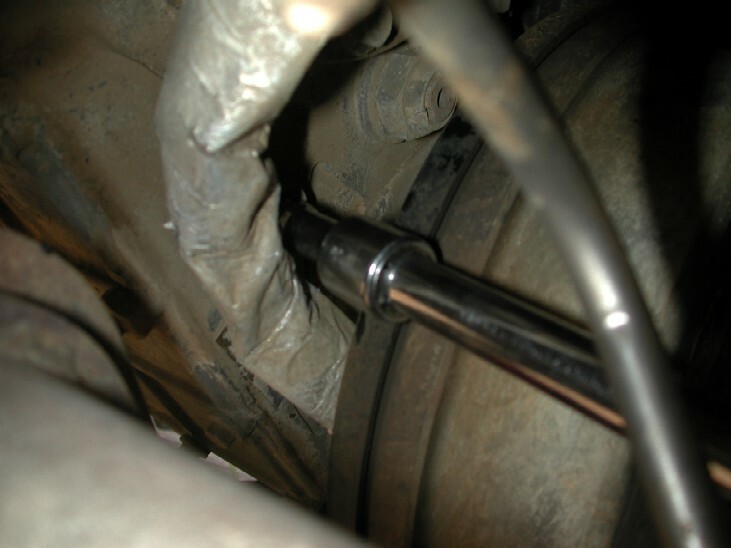 As usual there is always "something" in the way, the bolt in cross member is just below the drain plug and oil will hit that once it has slowed to a minimum flow. The drain plug is identical to the differential drain plugs in that it contains a magnet to collect any metal particles in the transfer box. You will see "some" stuff on there but not to much (I hope). This is the easy way to tell the 2 plugs apart, the fill plug has no magnet on it. 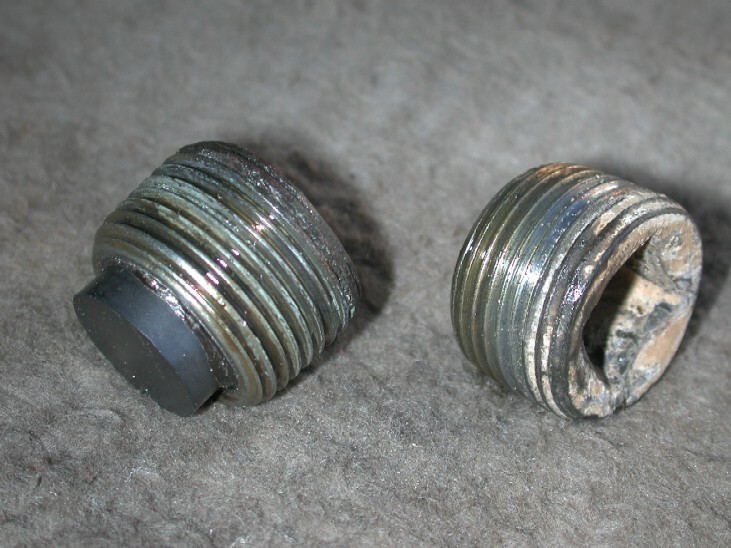 Below is the 2 plugs, the drain plug is on the left. Once the oil has finished draining, clean around where the fill plug goes, apply some loctite / thread lock to the threads and refit the drain plug and torque load it to 30NM or 22LBS ft.
Next is the more difficult part, because of where the fill hole is, it wont be possible to pour the oil back in from the bottles, so the only real solution is to pump it in. I looked for ages on EBay and other places for a small type oil container / pump for this job. It was not easy to find something, but I eventually stumbled across this little device below. It has a 1 litre capacity, a small plastic tube and a metal "filling" hook that will easily fit into the fill oil and hold / hang itself in there. Without this product or something similar, it will be very difficult to refill the transfer box with oil. I bought 2 of these and will use one for Diff / Transfer oils and one for the Auto box fluids. There is a larger capacity pump / container available from www.difflock.com but its quite pricey to be honest and I won't have the need to store large amounts of fluids. So when you ready, hook your little fill pipe into the fill hole and get pumping!! and fill the box until the oil runs in a 2mm bead from the fill / level plug. As stated it will need about 2.3 litres, so I had to refill my little pump 2 times to finish the job completely. Wipe and clean away any excess oil from the transfer box and cross member and job done! !